WILL YOUR RETURNS JUSTIFY THE INVESTMENT? The hardscapes market needs fresh products. By making Rosetta, you can join the ranks of concrete manufacturers who are looking ahead, and getting ahead with their customer bases. Year after year, more and more Rosetta Hardscapes products are being sold nationwide. What’s stopping you from joining the growth? 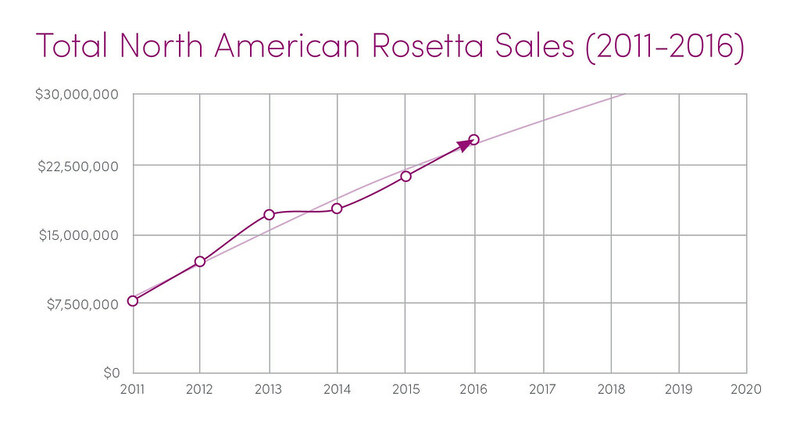 You might be wondering just how much return you could get selling Rosetta. We’d love to help you find out. Fill out the form below and we’ll get in touch with you. Please enter all information to help us serve you better! You know you want to get into wetcast hardscapes, but you might not know where to start. We’ll work with you every step of the way to develop your new wetcast block production plan. First, evaluate your resources. What kind of plant space do you have and who could you commit to selling a new product line? Imagine where the new line will go and how to best layout your systems for efficiency and potential future growth. Then start thinking about how many products your company could offer at the outset. You probably already have a good idea of the size of your market and the markets that you want to expand into. To get a feel for how Rosetta will perform in your territory, we suggest taking photos and brochures to key dealers and asking them what they think. Then sit down with landscape design and build firms and ask them to commit to trying Rosetta on a few of their projects. Start building an outside sales force that meets with landscape design and build companies and place displays in key dealer yards. Be sure to outfit them with plenty of pictures and sell sheets, all available from Rosetta Hardscapes. And get your production team up to speed, because the more committed your sales team, the busier your plant guys are going to be! Landscape dealers and contractors all over the world love Rosetta. When you become an exclusive Rosetta producer, you'll be setting yourself ahead of other concrete manufacturers in your region. By differentiating your product line with unique manufactured stone products, you'll also be able to increase the geographic scope of your business. Our two start-up packages offer exclusive manufacturing rights and guaranteed returns, so the path to profit is clear. Whether you opt for the Patio Package or the Outcropping Package, we’ve crunched the numbers...and we’re willing to share! Our own Michigan plant has seen sustained profit growth since it launched in 2009. But we’re not the only ones who have profited from manufacturing Rosetta. Over 18 other producers have seen a year over year increase in their return on investment in Rosetta molds and equipment.